Every year in September hundreds of people hike straight up to the summit of Pikes Peak (at well over 14,000 feet of elevation) for charity as part of the Pikes Peak Challenge. This year one paralyzed man is taking the Challenge to the next level, and will be making the 13 mile trek in a wheelchair. "I can't tie my shoes or button my shirt," said 42-year-old Glen House, "It's a lot of work, but it's unbelievably exciting." House, of course, won't be hiking up the mountain trail for 7,000 feet of elevation gain in his wheelchair, but instead he plans on taking the road up to the 14,110-foot summit of Pikes Peak where he'll have to contend with cars and traffic. So you want to be a triathlete but you are slow, out of shape, can't swim or run, and almost broke. Today we continue with the top ten gift ideas for that amatuer athlete in your life. This Top Ten List is arranged by expense. You'll find the part one of this story listed HERE. 6) Coaching: the triathlon gift that keeps on giving. How about getting that special triathlete in your life a coach? Person coaching can get a bit pricey but you can purchase online training plans or monthly training plans. We really like MarkAllenOnline.com We know Mark personally and you won’t go wrong with him or his partner in coaching Luis Vargas. With the holidays knocking at the door, we have updated our annual Top Ten gifts for that amatuer athlete in your life feature. Here they are arranged from least to most expensive. 1) If you or your tri buddy have any ambitions of ever doing an Ironman; “No Seriously My Training Starts Tomorrow The Everyman's Guide to IRONFIT Swimming, Cycling, & Running" by Roman Mica is a must read. This book chronicles the my first Ironman race as well as the many mistakes he made going from Everyman to Ironman It is a fun read that tells some of the best early race stories from somebody who has made every mistake in the book. *Cost $16.95 in paperback. It only seems right that at this holiday time of the year I take stock and give thanks---from a endurance athlete’s point of view. Now that I spend countless hours at the local pool, swimming back and forth like some caged and deranged zoo animal, I give thanks to modern chemistry. For without it the local youngsters would quickly turn my beloved Rec. center pool into what the ancient Greeks called the Urinarium. This wonderful modern stretchy fabric allows all athletes (men and women) to wear comfortable yet snug and tight fitting clothes over raced tuned bodies. Not only do they shade my eyes from the sun, but they allow all athletes to anonymously observe the wonders of tight fitting Lycra over race tuned bodies. So here I am on a hot and humid morning on Florida's space coast, running along the Banana river for just over 13 miles. I officially hit the wall at about mile 8. Because my training has almost entirely consisted of cramming for the half marathon the week before the race. For some unknown reason to me, the High Five Twister is usually a cute and youngish female runner who looks like she wants to high five every other runner that passes her. Typically her elbows are at about (let's call it ear level) and she twists her body 180 degrees with every step she takes. 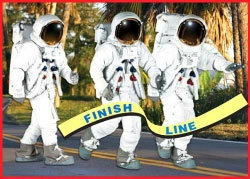 A couple year's ago I ran Florida's Oldest Marathon---The Space Coast Marathon. Actually I ran the half marathon and in proper collegiate fashion my training consisted of only cramming for the race. I basically ran about six to eight miles everyday for a week before the race. I bet you didn't know that you can cram for a half marathon? Well you can't. The results were predictable and I finished in 2:04 (plus some change) which happens to be about 15 minutes over my PR half marathon time at altitude. And last time I checked, Florida's Space Coast (Think Cocoa Beach from the old TV show I Dream of Jeanne) is only about a half a foot above sea level. There is no denying the fact that the World Triathlon Corporation knows how to put on a good and solid Ironman race. They have the people, places, and expertise to put together a seamless weekend of pre and post race festivities, along with a safe and fun race day experience. And yet, somehow Ironman Arizona is missing the soul of a great race. There is nothing wrong with this race per say. There is no sentence that can be uttered ending in "if only the race were...."
Editor's Note: Please do not listen to any of this advice! It goes against all of the current and conventional wisdom. Consider yourself warned that if you do listen to any of it you will forever stay slow, fat, and happy. There is just no way to sugarcoat this advice, so I won't and I'll just give it to you straight. Here's the Everyman method to have the best race of your life. I say you just forget about it completely. The science at best is dubious. Plus the scientist who study this sort of thing can't seem to agree on the value, if any, athletes derive from stretching. Today we continue with our Ultimate Top Ten Gift Guide for that special athlete in your life. This Top Ten List is arranged by expense. You'll find the part one of this story listed under yesterday's features and/or HERE. With the holidays knocking at the door, we have updated our annual Top Ten gifts for that special athlete in your life feature. Here they are arranged from least to most expensive. With Ironman Arizona just around the corner I thought it might be a good time to get leg shaking, stomach churning, head swooning nervous and scared. In less than two days I'll be starting another Ironman, and I'm already terrified of the start. I’ve been lucky enough throughout my sports life to compete in a number of different sporting events. I’m always amazed at how much gnashing of teeth and wringing of hands goes on in picking the first Ironman race. Considering that most of the North American races sell out in about 2.5 seconds, just getting into a race should be the main concern. But inevitably new Ironman athletes pick a race based on the difficulty of the race. The other day, while my back was turned and I was asking the sales clerk a question, a small round man absconded with my shopping cart. He just grabbed it and scurried away like a fat hungry weasel with a juicy chicken. So for all the fat hungry weasels in the world, here are Triathlon's Top 15 tips of Important Training Etiquette.